I always wanted to host a Christmas Cookies/care package exchange but never really had the right circle of friends to accomplish that. This year it was different though. I am blessed with some amazing friends I knew personally and through blogging who likes the idea when I told them about it. Is exactly one week before Christmas and I already received some of my gifts through mail. I got this box of goodies from Beachlover yesterday. I was on my way to Sam's Club when I saw the package in our mailbox. 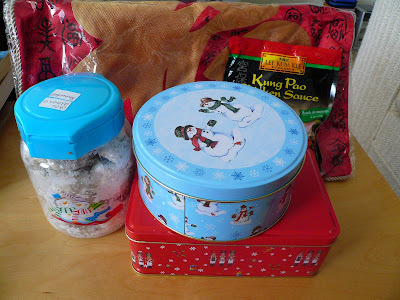 She sent me cookies, beautiful red pillowcase (I am going to use it for CNY) and Kung Po paste. Thank you my dear and we really enjoyed the cookies. I just want to let all of you know just how much I enjoyed and appreciates it. 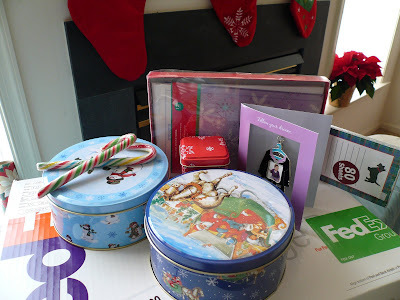 Hope we can do this again next year and this time I will have to start early with my shopping for the care package. PJ we got that from dollar store. In CA you might find it at 99 cents store. Oh, I didn't pick up the "care" part of the exchange, Gert. Just as well my participation is delayed. I now know what not to get for my recipients. :) David is enjoying your cookies A LOT. I think it has become his lunch and dinner since they arrived. I will safe up the postage and pass the cookies to you before you head back to states.....rite? Beachlover, are you going to pass me the dry sotong or your homemade sambal :) :) No need lah. I will try to buy it here. Thank you. Rita, glad that David likes the cookies.